The 656 Series are suitable for corrosive environments in chemical, petrochemical, refining, power, marine, and food and pharmaceutical processing applications. 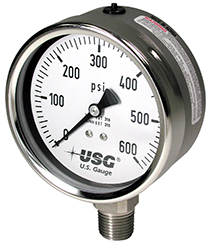 Liquid filled pressure gauges provide users with a number of advantages in certain measurement applications. They are ideally suited for uses on equipment where excessive vibration and pulsation are encountered, such as pumps, compressors, machine tools, etc. The liquid fill minimizes the effect of these severe environments, protects the gauge internals, and provides continuous lubrication on the mechanism, all adding up to extended service life. Liquid filling also provides greater protection of the gauge internals from corrosive atmospheres. AMETEK liquid filled gauges can be used with a variety of fill fluids including glycerin, mineral oil, and silicone oil. Available in a low mount, center back, and low back mount connections with front flange or u-clamp mounting options. Gauge size: 2½, 4 and 6"
Size: 2½, 4, or 6"